IN THE WATER AND READY TO GO! An immaculate one-owner Krogen 48' North Sea, Sisu III is arguably the best equipped Krogen 48' ever built. 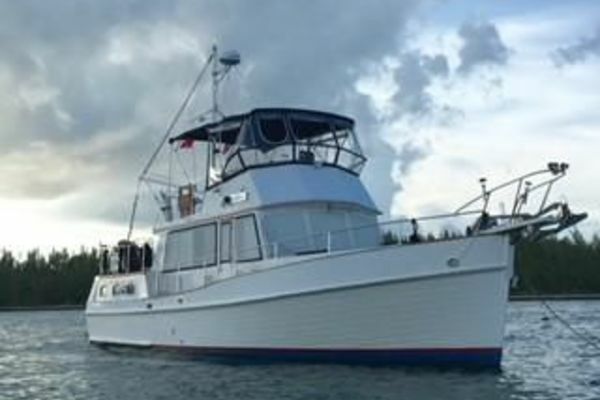 Bow and stern thrusters, stabilizers, hydraulic get home, A/C and diesel heat, watermaker, solar panels, two inverters, and an expanded bank of house batteries make Sisu III the ultimate yacht for your cruising dreams.Give us a call today to arrange a time to see this one-of-a-kind yacht. You will not be disappointed. United Yacht Sales New Jersey would love to guide you through a personal showing of this 48' Krogen 48 North Sea Widebody 2009. 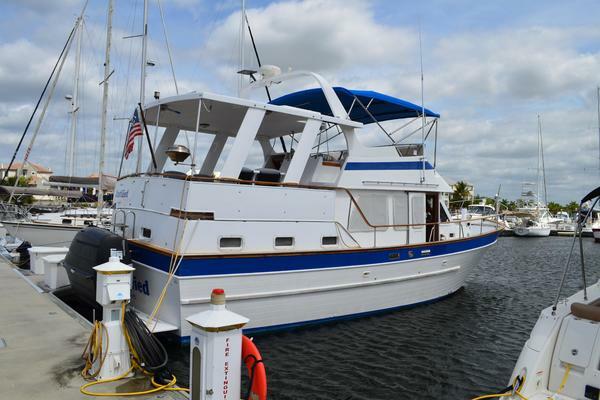 This yacht for sale is located in Annapolis, Maryland and priced at $959,000. For a showing please contact us by filling out the form on this page and we will get back to you shortly! Hull and superstructure molds from high-grade female tooling. Hull construction includes use of USA-made, Cook® gel coat. Hand-Laid Knytex® fiberglass construction with closed-cell PVC sandwich core used in topsides. Solid fiberglass below waterline with blister-resistant vinylester resin utilized on first two laminates below the waterline, with arimid fiber reinforcements. Superstructure includes end-grain balsa core and surface mats for print-through reduction. Teak aft and side decks. Boat and fore decks have GripTex® non-skid finish. Bulwark has molded plank lines with gel coat finish. Polyurethane formulate marine sealants used at hull-to-deck, boat deck joints and exterior fittings. Marine-grade plywood bulkheads with molded fiberglass hat section stringers. Teak veneer walls and cabinetry with satin varnish. Sisu III features a fully covered aft cockpit with a complete Ranier glass-like enclosure. Forward, through double weather-tight welded aluminum doors, is the salon with opening windows, ultra-leather upholstery, custom curtains, blinds and carpeting. Two household-type chairs are to port and dining settee with high-low table are to starboard. The galley is forward, open to the salon and complete withGE 18 cu. ft. stainless steel refrigerator / freezer,Viking 4-burner propane stove and oven,GE Profile stainless steel dishwasher,GE Monogram trash compactor,GE Profile convection oven, andRaritan ice maker. The accommodations are forward and down a few steps. The guest cabin/den/office is on the starboard side and features an L-shaped settee that coverts to an oversize double bed, a desk, numerous drawers and a large hanging locker. A lighted bookshelf is above the settee and three opening ports provide lots of light and fresh breezes. The guest head, with large stall shower, granite countertops, and VacuFlush toilet, is across from the guest cabin. A stack washer and dryer are also in the guest head. The master stateroom is forward with and island queen berth, lighted vanity over a chest of drawers, large hanging lockers and numerous other drawers and storage compartments. The en-suite head includes a VacuFlush toilet, granite countertops, and large stall shower. Multiple opening ports and two large overhead hatches provide light and natural ventilation. Up a few steps from the salon/galley area is the pilothouse with full navigational electronics suite, Stidd helm chair and L-shape settee with table. The settee converts to a double berth making the pilothouse a convertible third cabin.